5GCity consortium includes different media-related partners, a television channel, a national broadcaster, and a SME focused on content acquisition and production in the Cloud or an association of media companies. Three different media use cases will be deployed and evaluated (mobile real-time transmission, UHD video distribution, and real-time video acquisition and production in the Edge & Cloud). 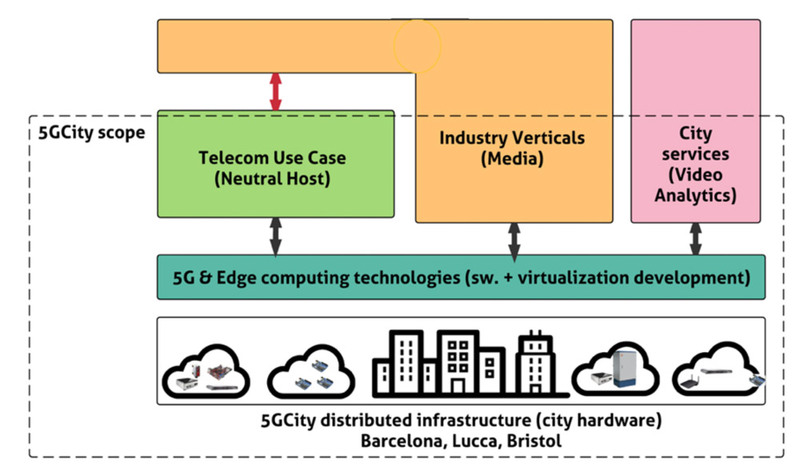 5GCity will leverage its virtualization platform in order to enable the cities to create dynamic end-to-end slices containing both virtualized edge and network resources and lease it to third-party operators. The city of Lucca holds some yearly events that are highly disproportionate to the city size, resulting in a number of issues including illegal waste dumping. 5GCity will use the cities’ surveillance cameras and deploy (multiple instances of) a virtualized service that can process video streams near cameras automatically to identify illegal dumping.